But some questionable labor conditions exist right here at home, where those imported goods are funneled into the domestic supply chain. Labor groups and regulators point in particular to problems faced by temporary workers who staff huge warehouses that line freeways and rail yards outside Los Angeles. The 'temporary' workers who staff the warehouses don't actually work for Walmart. They temp for agencies that place them in warehouses managed by companies contracted by Walmart. There are sometimes three or four layers between the workers who move Walmart's goods and Walmart itself. Which means no job stability and no benefits for the workers. The following photos are of the people who work the supply docks, their families and the people who employ them. When Pedro Landeros protested the conditions in a warehouse located in Mira Loma, California, he says his hours were cut back drastically. But Landeros says that even if he were able to increase his hours to full-time at the Walmart-contracted warehouse, it wouldn’t be enough money to care for his family. Mary Revolorio stays at home with her two kids while her boyfriend, Victor Caudillo, works at a Walmart-contracted warehouse unloading trucks. Revolorio says it’s a struggle to find enough food to feed their family and worries how they’ll get by with what little Caudillo brings home. Dilma Fuentes passes out flyers to workers at the Walmart-contracted cross dock (warehouse) facility. Labor groups and unions are working to organize the workers to demand that Walmart be responsible for them when they're injured, and to give them the benefits of full-time workers. Most workers at the facility are temps, but some have worked as 'temporary workers' at the warehouse for over a decade. Ed Jankay is in charge of a facility that moves goods for Walmart in Mira Loma, California. He says that while around 90 percent of the staff at the facility is temporary, there are opportunities to move up. Jankay’s been doing warehouse work for over thirty years but has never worked as a warehouse temp. 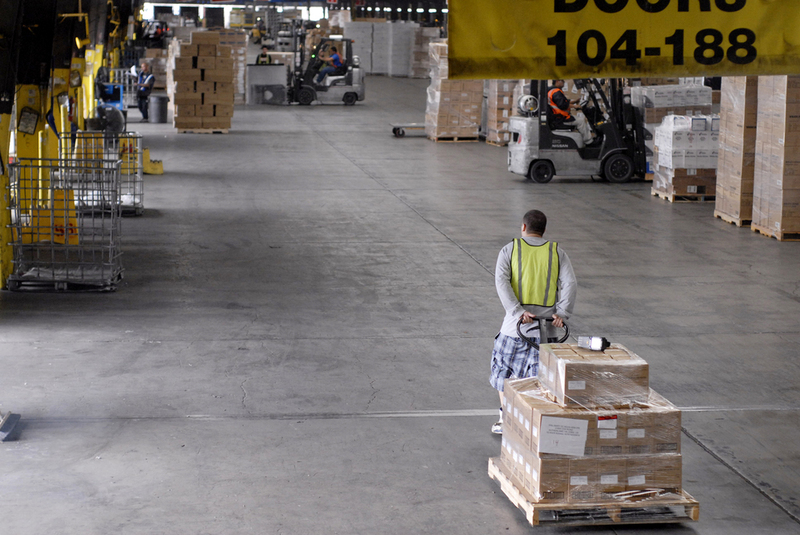 A worker pulls a pallet of goods across a cross-dock facility in Mira Loma, California. The hub is the biggest consolidation facility in the country. Workers move goods like exercise bikes and Barbie dolls from vendor trucks to Walmart trucks, which then fan out to drop off loads as far as Maine. 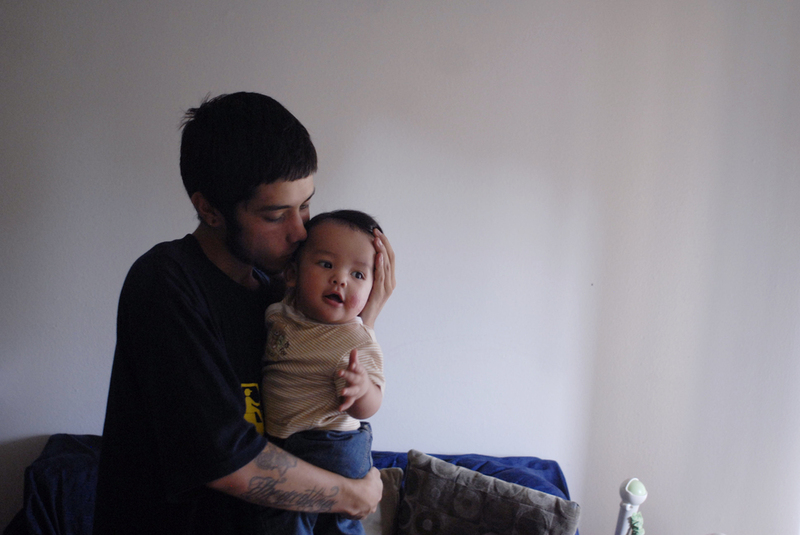 Victor Caudillo holds his son, Noah, in the living room of his apartment in San Bernardino, California. Caudillo, 20, says supporting his family of four, a little brother and a cousin, all on part-time warehouse work that pays $8 an hour is a struggle. The warehouse where he works recently cut his hours. Caudillo wonders how he'll continue to get by on an even smaller paycheck than usual.